Get ready for the ride of your life by helping to improve and save the lives of Children's Hospital Colorado patients. The 2014 Courage Classic is an annual three-day, 155 mile bicycle tour that begins and ends in Copper Mountain, Colorado. The first day is 80 mile loop from Copper Mountain to Climax Mine/ Freemont, Ski Cooper/Tennessee Pass, Camp Hale, Minturn, Vail, Vail Pass and back to Copper Mountain with 3,985 feet of climbing. Day two is a 42 mile loop from Copper Mountain to Frisco, Dillon, Keystone, Swan Mountain, again to Frisco and back to Copper Mountain, with 2,230 feet of elevation gain. The final day is a 31 mile loop from Copper Mountain to Breckenridgeback to Copper Mountain, with 2,113 feet of elevation gain. 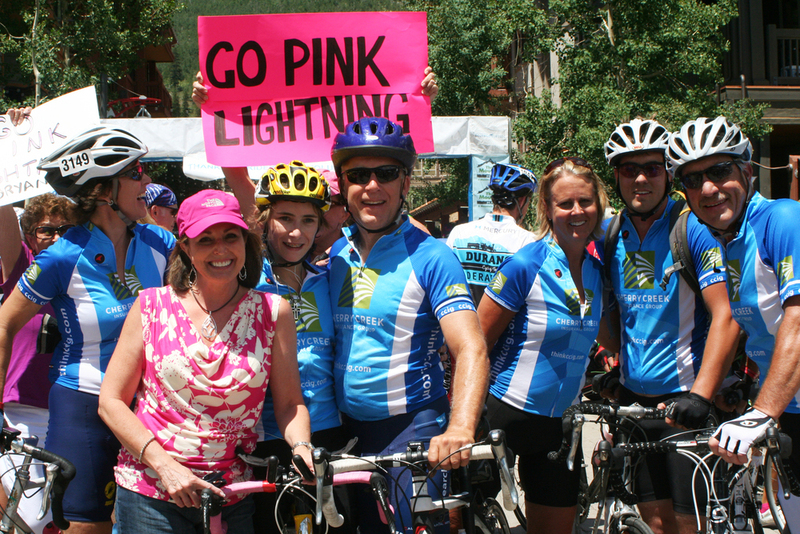 Members of the Cherry Creek Insurance Group team riding in the 2013 Courage Classic. Funds raised through the Courage Classic benefit the Children's Fund, helping Children's Hospital Colorado sustain and improve care for kids by addressing the hospital's areas of greatest need. Purchasing essential new medical equipment, covering the cost of care for patients unable to afford treatment, or supporting new child health research are a just a few examples of how donations can impact local children. Be a part of the fun and do a good deed at the same time. To be a part of the Pink Lightning Team click here.